Effect of spent engine oil contaminated soil on Arachis hypogea (L.), Zea mays (L.) and Vigna unguiculata (L.) Walp. Osuagwu, A. N.*, Ndubuisi, P. and Okoro, C. K.
Department of Plant Science and Biotechnology, Michael Okpara University of Agriculture, Umudike, Nigeria. *To whom correspondence should be addressed. E-mail: ann_osuagwu@yahoo.com. Received 13 July, 2017; Received in revised form 26 August, 2017; Accepted 04 September, 2017. Spent engine oil, Contaminated soil, Germination percentage, Seedling growth. 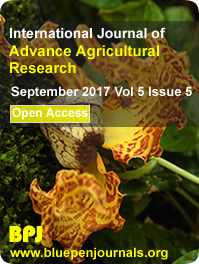 The effect of spent engine oil contaminated soil on the germination and seedling growth of Zea mays, Arachis hypogea and Vigna unguiculata was investigated in the screen house of Department of Plant Science and Biotechnology, Michael Okpara University of Agriculture, Umudike, Abia State, Nigeria. The research work was done using Complete Randomized Design (CRD) replicated three times. Sixty-three perforated planting buckets were filled with 5 kg of soil. Treatment was applied one week before planting of the seeds. The planting buckets filled with soil were contaminated with spent engine oil at volumes of 0, 50, 100, 150, 200 and 250 ml; while the non-contaminated soil served as the Control experiment. The experiment lasted for 12 weeks. Data obtained were analyzed using Genstat Discovery (4th Edition) and least significant difference (LSD) at p˂0.05. The results obtained reveal that germination percentage, days to germination and rate of germination and seedling growth were significantly (P<0.05) affected by the spent engine oil contamination. The results of the study indicates that A. hypogea has more potential to be utilized for phytoremediation of spent engine oil contaminated soil than Z. mays and V. unguiculata.